A Wayne County mother claims her 15-year-old daughter was booted from a Spirit Airlines flight from Tampa to Detroit without notice. Now, she's taking action and suing the airline. The alleged incident happened in April 2018 when the family was returning from Ft. Lauderdale, and had to switch planes in Tampa. 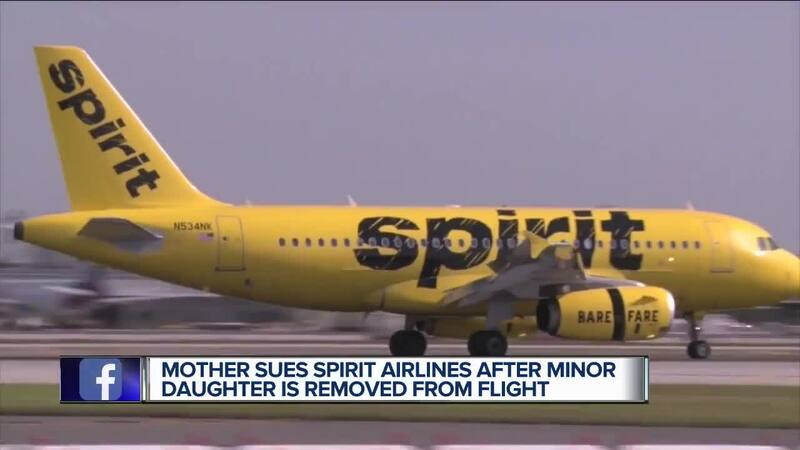 METRO AIRPORT (WXYZ) — A Wayne County mother claims her 15-year-old daughter was booted from a Spirit Airlines flight from Tampa to Detroit without notice. Now, she's taking action and suing the airline. The alleged incident happened in April 2018 when the family was returning from Ft. Lauderdale, and had to switch planes in Tampa. Stacy Giordano had a seat with her son in the back of the plane, and her daughter was reportedly assigned to a seat in the front of the aircraft. That's when Giordano's attorney Jerry Thurswell says the teenager was removed from the plane suddenly to make room for another passenger due to overbooking. “They didn’t want to hear anything. They just pulled her off the plane," Thurswell told 7 Action News. Thurswell said the teenager attempted to reach her mother by phone, but was unable to because of the airline's mandatory "airplane mode" policy on cell phones; Giordano's phone was not receiving messages. The teenager was put on another flight back to Detroit hours later. Giordano didn't realize her daughter was gone until mid-flight. “When the child says my mother’s in the back of the plane why are you taking me off and they just take the child off and say sit here you’ll be on the next flight out - you don’t just separate a child from their mother," said Thurswell. The family is suing for more than $75,000 in damages.